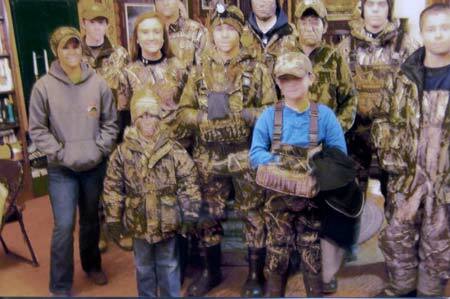 The Saluda County Historical Society Annual Youth Duck Hunt was held Saturday, February first, at Padgett Pond and Lands of the Randy Barnes Family in Saluda County. A large number (12) from Saluda, Edgefield, Lexington, and Aiken Counties availed themselves of this opportunity to explore waterfowl hunting as well as explore the ducks’ natural habitat. Experienced volunteer guides provided their enterprise in calling ducks and other waterflowl hunting skills. The youth harvested eleven ducks mostly wood ducks with a few migrating mallards. After the hunt, the youth, their accompanying adult, and guides were served a breakfast of pancakes and ham provided by the Saluda County Historical Society. The Youth Hunters were: Parker Barnes, Walker Mitchell, Texanna Miller, Carolyn-Barrett Guess, Cole Rikard, Davis Kuipers, Brooks Taylor, Brett McEwen, Jacob Harter, Zack Berry, and Tristan Wheeler. The volunteer guides were: Phillip Hurt, Matt Corley, Adam Barnes, Randy Barnes, Padgett Sumner, Travis Sumner, and Alex Berry.